The RAF Bomber Command raid on Nuremberg on 30-31 March 1944 resulted in the highest number of aircrew losses for any single air mission in World War 2. Out of 779 bombers sent to attack 105 did not return. 534 airmen took their last steps from British airbases on that night with a further 157 being captured or taken prisoner. This interactive map charts those losses. It was produced for and displayed at a national event to mark the 70th anniversary of the raid, which took place at the former RAF East Kirkby (now Lincolnshire Aviation Heritage Centre), Lincolnshire, UK. 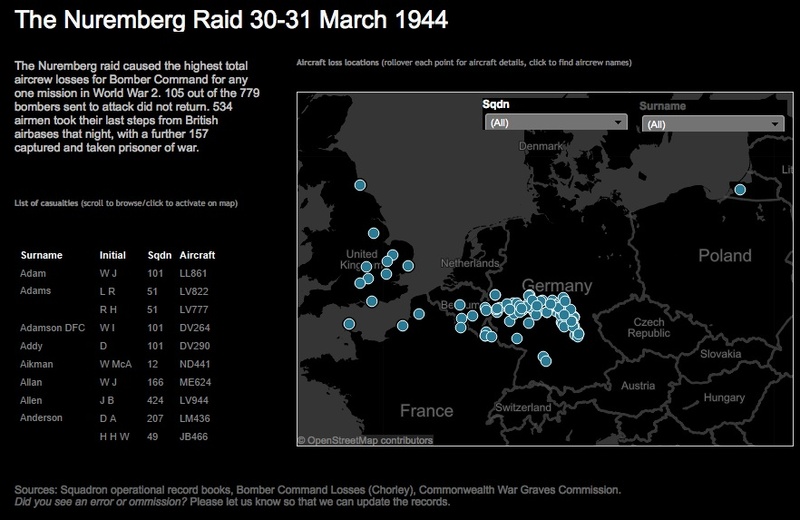 Based upon published numerical data sources (Chorley, 1997 & Commonwealth War Graves Commission) this interactive map is searchable by crew name, squadron and aircraft. It is intended to aid museum visitors, participants friends/family and historians to visualise and navigate the loss data.